His older brother, Oswaldo, is a former Major League outfielder with Minnesota (2013-16), Tampa Bay (2016), Miami (2016) and San Diego (2016).....he now plays in Japan. Batted .236 with 3 HR and 30 RBI in 119 games with Milwaukee ... Made 92 starts, all at shortstop ... Had three stints with the team (Opening Day-5/24, 5/30-6/30 and 7/26-end) ... Also appeared in 22 games at Triple-A Colorado Springs, batting .341 with 2 HR and 8 RBI ... Won four games with go-ahead RBI in the ninth inning or later: 3/29 at San Diego (RBI-single in 12th), 4/6 vs. Chicago-NL (RBI-single in 9th), 4/9 at St. Louis (bases-loaded walk in 10th) and 8/24 vs. Pittsburgh (RBI-single in 15th) ... Batted .311 (37-for-119, 1hr, 13rbi) over his last 44 regular season games, including a 7-game hitting streak to end the season (11-for-26, .423, 3rbi) ... Collected a career-high 4 hits in the NL Central tie-breaker game on 10/1 at Chicago, going 4-for-4 with 2 runs in the 3-1 victory ... Including the postseason, finished the year on a 16-game hitting streak during which he batted .373 (22-for-59) with 3 HR and 7 RBI ... Batted .333 (11-for-33) with 3 HR and 4 RBI in 10 games during the postseason ... Played for Anzoategui in the Venezuelan Winter League. Made his first career Opening Day roster...Batted .277 with 15 HR, 53 RBI and 14 stolen bases in 153 games during his first full season... Made 137 starts, all at shortstop... Batted just .208 (26-for-125, 4hr, 15rbi) over his first 38 games of the season but rebounded to hit .299 (114-for-381, 11hr, 38rbi) over his last 115 games, 14th in the NL (beginning 5/18)... From 9/6/16-4/23/17 had an errorless streak of 42 games at shortstop, tying Royce Clayton (2003) for the second-longest streak in franchise history (Mark Loretta, 63g, 2000-01)... From 5/18-5/31 produced a career-high 11-game hitting streak, batting .370 (17-for-46, 2rbi)... Hit the 27th inside-the-park homer in franchise history on 6/17 vs. San Diego.....was the first inside-the-park homer by a Brewer since Norichika Aoki on 4/20/12 vs. Colorado... Belted a game-tying solo homer in the ninth inning off Wade Davis on 9/23 vs. Chicago-NL, giving the Cubs' closer his only blown save of the season (32 saves)... Played for Oriente in the Venezuelan Winter League. Entered the season as the top prospect in the organization and eighth-best prospect in all of baseball according to Baseball America...Began the season at Triple-A Colorado Springs, where he batted .267 with 8HR, 53 RBI and 15 stolen bases in 100 games .....was a Pacific Coast League All-Star...Was recalled by Milwaukee on 8/2...Batted .219 with 4 HR, 17 RBI and 8 stolen bases in 55 games with the Brewers ...Made 53 starts, all coming at shortstop...Committed just 1 error over his last 39 games, including none over his last 24 contests...Made his Major League debut on 8/2 at San Diego, starting at shortstop (0-for-4, 1k...Recorded his first Major League hit on 8/5 at Arizona with an RBI-single off Braden Shipley...On 8/6 at Arizona joined Wayne Comer (1969) and Scott Podsednik (2003) as the only rookies in franchise history to score 4 runs in a game...Hit his first Major League home run on 8/26 vs. Pittsburgh with a 3-run shot off Jared Hughes...Following the season played for Oriente in the Venezuelan Winter League. Entered 2015 as the second-best prospect in the organization according to Baseball America…Was named Brewers Minor League Player of the Year after batting .307 with 8 HR, 69 RBI and 25 stolen bases in 129 games at Double-A Biloxi…Was selected to both the Southern League's midseason and postseason All-Star teams…Participated in the All-Star Futures Game at Great American Ball Park in Cincinnati…Ranked among the Southern League leaders in doubles (1st, 37), hits (2nd, 157), total bases (2nd, 232), extra-base hits (3rd, 52), batting average (5th, .307), runs (5th, 74), RBI (5th, 69) and slugging percentage (5th, .453)…Following the season was ranked as the third-best prospect in the Southern League by Baseball America.....was a Rawlings Minor League Gold Glove Award winner…Played for Anzoategui in the Venezuelan Winter League (31g, .312, 1hr, 18rbi)…Added to the 40-man roster on 11/20…Enters 2016 as the top prospect in the organization according to Baseball America. 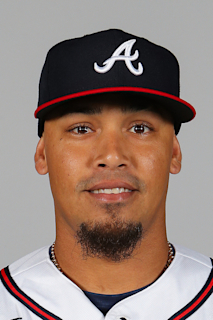 December 4, 2018 1B Orlando Arcia assigned to Caribes de Anzoategui. July 26, 2018 Milwaukee Brewers recalled SS Orlando Arcia from Colorado Springs Sky Sox. July 1, 2018 Milwaukee Brewers optioned SS Orlando Arcia to Colorado Springs Sky Sox. May 30, 2018 Milwaukee Brewers recalled Orlando Arcia from Colorado Springs Sky Sox. May 25, 2018 Milwaukee Brewers optioned SS Orlando Arcia to Colorado Springs Sky Sox. August 2, 2016 Milwaukee Brewers recalled Orlando Arcia from Colorado Springs Sky Sox. March 14, 2016 Milwaukee Brewers optioned SS Orlando Arcia to Colorado Springs Sky Sox. November 20, 2015 Milwaukee Brewers selected the contract of Orlando Arcia from Biloxi Shuckers. October 3, 2015 SS Orlando Arcia assigned to Caribes de Anzoategui. March 11, 2015 SS Orlando Arcia assigned to Milwaukee Brewers. January 30, 2015 SS Orlando Arcia assigned to Venezuela. October 9, 2014 SS Orlando Arcia assigned to Caribes de Anzoategui. September 4, 2014 Orlando Arcia assigned to Huntsville Stars from Brevard County Manatees. July 13, 2014 Orlando Arcia roster status changed by Brevard County Manatees. July 11, 2014 SS Orlando Arcia roster status changed by Brevard County Manatees. March 30, 2014 SS Orlando Arcia assigned to Brevard County Manatees from Wisconsin Timber Rattlers. March 30, 2013 SS Orlando Arcia assigned to Wisconsin Timber Rattlers from AZL Brewers. March 17, 2013 SS Orlando Arcia assigned to Milwaukee Brewers. August 30, 2012 Orlando Arcia roster status changed by AZL Brewers. June 14, 2012 SS Orlando Arcia assigned to AZL Brewers from Helena Brewers. April 3, 2012 SS Orlando Arcia assigned to Milwaukee Brewers. March 27, 2012 Orlando Arcia assigned to Helena Brewers from DSL Brewers. May 28, 2011 Orlando Arcia assigned to DSL Brewers. October 22, 2010 Milwaukee Brewers signed free agent SS Orlando Arcia to a minor league contract.